I hope that everyone had an awesome weekend. I sure did. It was beautiful here in Orlando, and I was able to spend time with lots of friends. 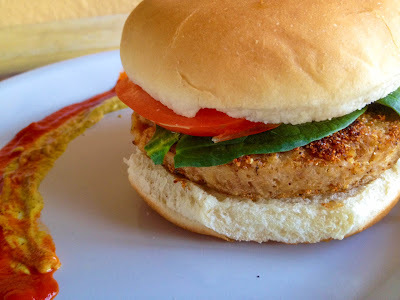 Anyways, I figured I'd share this recipe because it's quick and easy, and I just loved the way the seasonings came together on these burgers. Feel free to omit the sriracha if you're not a fan of spicy. I just figured that it was a nice change from ketchup (and I just picked the sriracha up the other day and wanted to use it). 1. Heat the oil on medium-high heat. Add the Boca burgers, and sprinkle the salt, garlic powder, cayenne, paprika, and seasoned salt over them. Flip burgers so that they have the seasonings and oil on each side. 2. Reduce heat to medium, and continue cooking for another 10 minutes, flipping occasionally. 3. Serve on buns with spinach, tomatoes, sriracha, and brown mustard. (I put my sriracha and brown mustard on the side, just in case I wasn't feeling the heat of the sriracha).